Our FOSHAN FANGTIAN TECHNOLOGY CO,. 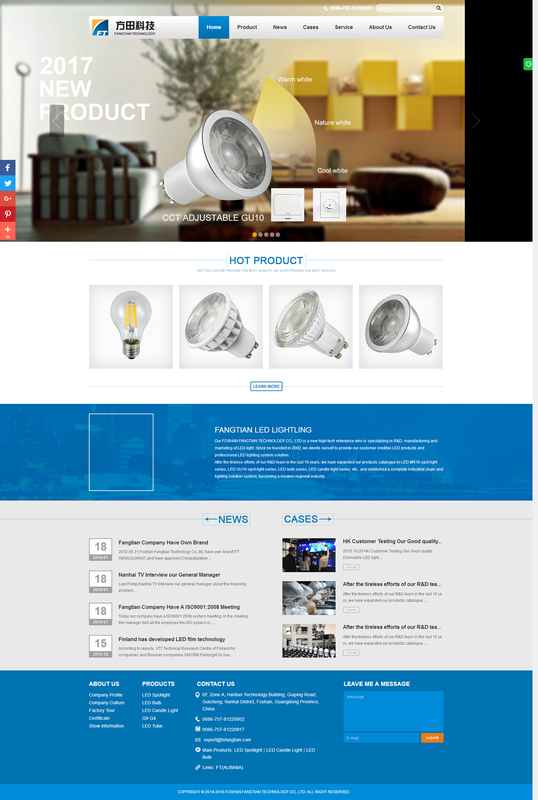 LTD is a new high-tech enterprise who is specializing in R&amp;D, manufacturing and marketing of LED light. Since be founded in 2002, we devote ourself to provide our customer credible LED products and professional LED lighting system solution. <p>After the tireless efforts of our R&amp;D team in the last 10 years, we have expanded our products catalogue to LED MR16 spot light series, LED GU10 spot light series, LED bulb series, LED candle light series, etc., and stablished a complete industrial chain and lighting solution system, becoming a modern regional industry. <p>During these years, we keep improving the core technology of our LED products, which brought us many high-tech rewards and patents, for example, the 360 degree beam angle LED bulb patent and the trailing edge phase contral system patent. Keeping an eye focus on the development of LED lighting, we know the fashion and the customer needs very well, and always stand in the leading edge of LED technology.